have no reason at all, and that it is nature which acts in them according to the disposition of their organs, just as a clock, which is only composed of wheels and weights is able to tell the hours and measures the time more correctly than we can with all our wisdom. The three sections which make up Second Nature – Experience, Coexistence, Emergence – include summary descriptions of and discussions about academic research cataloging how each animal is a “unique individual with personality traits, an emotional profile, and a library of knowledge built on experience.” In short, “not just biology, but a biography.” (204) Balcombe writes about, for example, democratic bees, cooperative rats, urine-reading elephants and much more. These descriptions are interwoven with accounts from Balcombe’s own non-invasive, scientific research in the field and anecdotal stories from observations he made of his two cats, Mica and Megan, and other animals and birds he’s observed out and about. Indeed, reading Second Nature made me realize the importance of watching nature carefully and how it is possible to learn much from what takes place around you. For example, I live in a small community on the southern English coast which has one of the most densely populated colonies of gulls. In the spring and summer, they nest on nearby rooftops and their mating, breeding and rearing makes fascinating viewing. 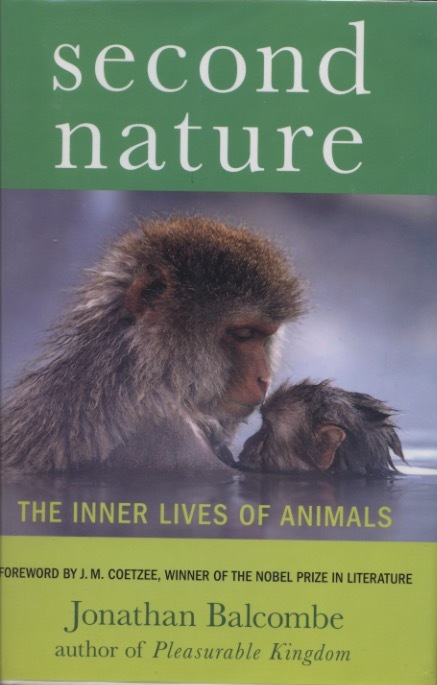 As intriguing as it is to learn about the rich and complex lives of animals, the chapters in Second Nature which I found particularly interesting are those in which Balcombe explores the consequences of knowing about the inner lives of animals. This starts with Chapter Eight, “Being Nice: Virtue,” which forcefully makes the case that, as it is for humans, it is also true for animals that there are benefits from living cooperatively in groups. Imagine such a group without the “unwritten moral code,” Balcombe writes, large lions would kill and eat small ones. “Such behavior would soon lead to group disintegration.” He does not claim an “absence of violent conflict in animal societies” (123) but, as he discusses in Chapter Nine, “Rethinking Cruel Nature,” nature is not as “red in tooth and claw” as we would like it to be. For starters, I did not know that Alfred, Lord Tennyson’s poem, “In Memoriam A.H.H.,” is dedicated to a friend who died suddenly. The infamous quote has nothing to do with the alleged behavior of animals at all. It is, of course, understandable to be angry about the sudden loss of a loved one. Nonetheless, we are guilty of misappropriation and misrepresentation every time we take that line from the Victorian poem unrelated to the subject at hand and transform it into a cliché to allege a universal truth about animal behavior that is not true.